2. Every player with a ball. 1. 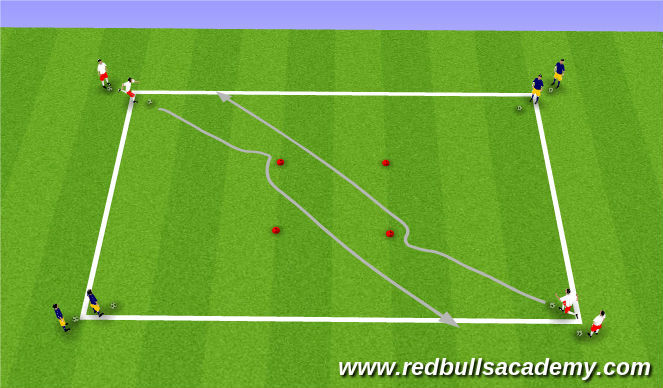 Players dribble in open area. 2. Dribble like Messi and Ronaldo. 3. Use of both feet. 1. Players distributed evenly at corners as shown. 3. Central square is 5x5. 4. Starting position at corner is 10-15yds from closest cone in middle. 1. 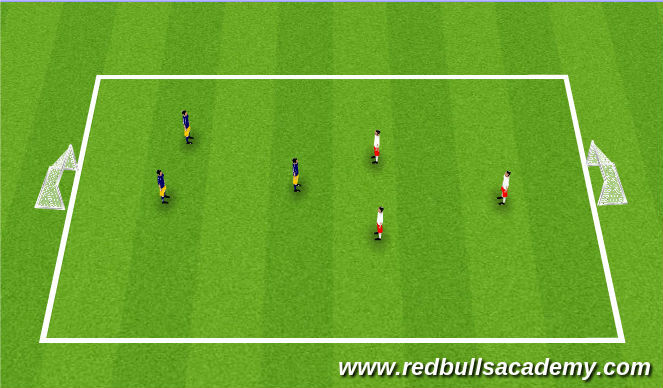 First player from each white team runs through square upon making eye contact. 2. As soon as they are out of the square, the first players from blue group do the same. 3. Process repeats for set time (2-3 minutes). 4. Players must perform feint at red cone before running through square. 1. Connection with teammate - eye contact. 2. Weight and direction of first touch - positive (into space). 3. Speed of approach - slow down as you get close to target. 1. 30x20 area with 5x5 square in center. 2. Players distributed evenly as shown. 3. Attackers (shown in white) with balls. 4. Mini goals set up at ends as shown. 1. Attacker starts with the ball. 3. Attacker looks to score on either of two goals. 4. 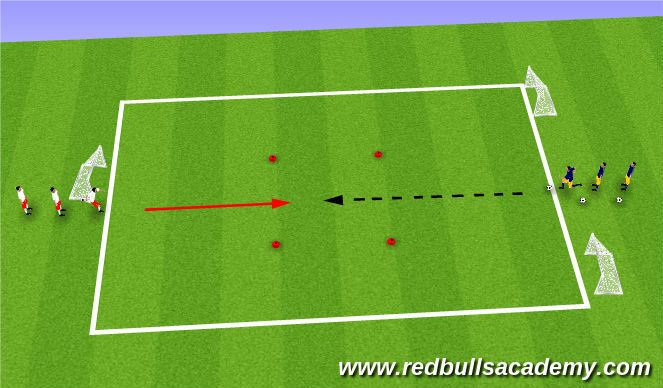 Before scoring, attacker must enter center grid. 6. Players return to same lines. Rotate every 2-3 minutes. 1. Positive first touch - take space quickly. 2. Head up to assess pressure. 3. Drive at defender at speed. 4. Accelerate away to lose defender - Ronaldo. 2. Teams set up as shown. 2. Restarts: kick-in or dribble in. No corners. 2. Movement and angles of support to create space. 3. Positive mentality - get forward.